Diamond used to be regarded as the hardest substance known to man. But Wurtzite Boron Nitride which shares diamond’s chemical structures, but contains different atoms, now holds that position. Diamond is a naturally occurring chemical compound made up entirely of the element carbon. It has a 3 dimension crystalline structure, responsible for its hardness. The compound, diamond, has the same chemical make up as graphite – also made entirely of the element carbon, but with a dissimilar physical structure as diamond (the difference between both compounds is simply in the way the carbon atoms are arranged within each compound). The compound, diamond, has other uses besides being an item of ego and decoration as mostly touted in the movies and celebrities with too much money than any one person truly needs :-). One is as a cutting or abrasive device in industrial cutting tools. Diamond have not always been the symbol of romance that it has become today – that is someone’s idea come true. Diamonds are forever, is the outcome of a successful marketing campaign commissioned in 1947 by deBeers and executed by the advertising agency N.W Ayer. 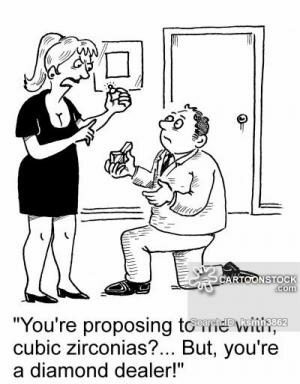 The campaign was so successful, that we still ear its echoes today as a lot of people now associate expensive diamond crusted engagement rings as symbols of commitment to marry (or stay married).